What is happiness? Look inside your heart for the answer. How often have you thought to yourself "I'll be happy when..." Lasting happiness is an inside job. All the other things we think will make us happy probably do...temporarily. The new house, new car, or new job become old rather quickly. When the thrill wears off, we're right back where we started. wherever you are, close your eyes, take a deep breath and exhale slowly. Then open your eyes and look at your surroundings in a new way. Look for the beauty that is always around you. Be present with it and appreciate it. 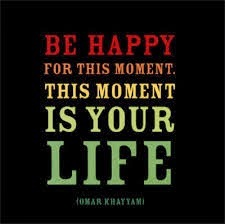 In this brief moment, you will find happiness. And the more often you practice this, the longer the happiness will last. Each of these precious moments that you become aware of your surroundings really is your life.